The hosts are just grossed out at this point. Rob is wondering whether they are vampires or zombies. The Strain has 13 episodes so they’re definitely gonna be here for a while. Josh thinks this is a weird show. It’s unlike anything that’s on right now and it’s scratching off the Walking Dead itch he has been having since the show ended. It has a little bit of a 24 vibe because of the cast. Josh thinks it is a very weird vampire show. He hasn’t read the books and decides to just enjoy the show. 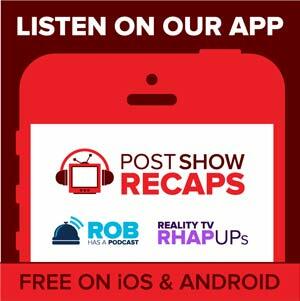 Rob agrees it’s like a Post Show Recaps All Stars because of the cast who also appeared on other shows aside from 24 like Game of Thrones and Lost. A lot of familiar faces here. Rob comments that the show is interesting but it takes a little bit of time to get into the cool stuff by the end. Josh has got vague notions about what’s happening. He doesn’t understand why Sean Astin is working with the Stoneheart Group and how did they vampire turn all of the passengers of the Regis flight. Just based on where they left off with the ending, Josh feels the pace of the show is going to be frantic. Rob has got a lot of questions and asks Josh to talk him through it. Rob says the coolest scene of the episode is when all of the dead people getting autopsied and they come alive and kill the guy conducting the autopsy. When a happy song is playing, something very disturbing is more likely about to happen. Rob is confused if the four people on the plane are zombies. The creepy guy with flickery eyes has to be a vampire. Rob is just having a hard time putting these people into the appropriate categories of what they are. There are some mysteries that need to be solved. Because people didn’t listen to Abraham’s advice to destroy the coffins, these people are in deep trouble. The beating thing in the jar that feeds off Abraham’s blood seems to belong to someone that Abraham cares about. Obviously, Abraham has dealt with something like this before. We can assume that Abraham is some sort of a vampire slayer. Josh says he would not be surprised if there are no Nazi and World War II scenes considering that Guillermo del Torro is the director. Josh is also expecting some holocaust flashbacks with Abraham being a holocaust survivor. Ephraim or F is an A+ employee and an “F” father. He has got some ego issues. Rob’s biggest issue with Ephraimis why does he have to drink milk all the time. Josh says he’s a specific guy and if you are a genius, then you have to be crazy. Josh foresees that the boyfriend of F’s wife is gonna be eaten by a vampire. The narration that opens and closes the episode seems confusing and Josh doesn’t know how that ties into the story so far. Or perhaps there is a romantic factor behind the Stoneheart Group. Maybe love is going to be a big theme on the show, being that F wants to reunite with his family and be with his kid. Sean Astin’s character seems like a good guy but turns out to be the prospect”mole” for the season. This show is occupying Josh’s interest in terms of the mole patrol. We have to be on high alert regarding Sean’s character. Otherwise, they wouldn’t be putting a star actor for nothing. The big thing living in the coffin is also in question. Is he the man in charge or is he just working for the Stoneheart Group? What they’re sure of is it has to be shipped to New York. Josh gets the vibe that the creature is a valued guest. It may be a tornado of blood-sucking disaster that works on its own. What the creatures does to Mikhail seems to be over the top yet Josh thinks it’s awesome. The autopsy scene is the best TV scene of the week for Josh. Good music choice. Josh is excited to see the vampire-zombie thing that’s going on. He thinks it’s super cool. The rockstar guy is a unique, interesting character. The show starts with an ill-fated airplane ride which is interesting. Josh hopes he gets the answers to the questions as to how they became a vampire. Rob likes that it’s not an airborne virus. It seems you really have to get the thing on you. And that’s where you’re gonna see the nasty scenes. Josh thinks the show is veering into a fantasy element or leaning on some sci-fi. Josh would classify the genre as pure madness. It’s a show that is not like anything on TV. He thinks we’re heading into something epic.